For photos, traveler tips, ratings, and tourist information, you can read our Chennai trip itinerary planner . Salem to Chennai is an approximately 6-hour car ride. In June, daytime highs in Chennai are 43°C, while nighttime lows are 31°C. You'll set off for Barcelona on the 6th (Thu). Barcelona is known for parks, nightlife, museums, shopping, and fun & games. Your plan includes some of its best attractions: admire the striking features of Basilica of the Sagrada Familia, admire all the interesting features of Camp Nou, see the interesting displays at Museo Picasso, and browse the exhibits of Casa Mila - La Pedrera. Planning Barcelona trip won't be overwheling when you use's Insprock itinerary maker. You can fly from Chennai to Barcelona in 17 hours. Another option is to do a combination of train and flight. The time zone difference moving from India Standard Time to Central European Time is minus 4 hours. Traveling from Chennai in June, expect nights in Barcelona to be slightly colder, around 22°C, while days are cooler, around 30°C. Finish your sightseeing early on the 9th (Sun) to allow enough time to take a train to Madrid. Madrid is known for museums, parks, shopping, nightlife, and historic sites. Your plan includes some of its best attractions: see the interesting displays at Prado National Museum, explore the world behind art at Royal Palace of Madrid, steep yourself in history at Casa de Campo, and make a trip to Puerta del Sol. Plan a Madrid trip in moments using our itinerary builder. Traveling by train from Barcelona to Madrid takes 3 hours. Alternatively, you can fly; or drive. When traveling from Barcelona in June, plan for somewhat warmer days in Madrid, with highs around 36°C, while nights are little chillier with lows around 19°C. Cap off your sightseeing on the 12th (Wed) early enough to catch the train to Seville. Seville is known for parks, nightlife, historic sites, museums, and fun & games. 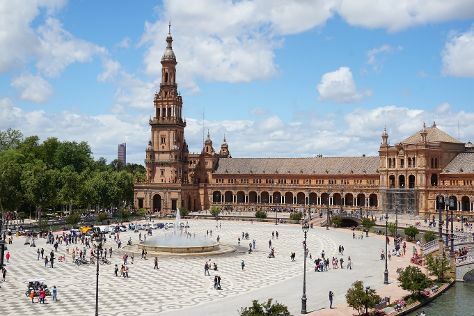 Your plan includes some of its best attractions: admire the striking features of Plaza de España, contemplate in the serene atmosphere at Catedral de Sevilla, admire the natural beauty at Royal Alcázar of Seville, and don't miss a visit to Metropol Parasol. Make your Seville itinerary with Inspirock to find out what to see and where to go. You can take a train from Madrid to Seville in 3 hours. Alternatively, you can fly; or drive. In June, daily temperatures in Seville can reach 35°C, while at night they dip to 20°C. Wrap up your sightseeing on the 15th (Sat) early enough to drive to Ronda. Ronda is known for historic sites, nature, museums, nightlife, and wineries. Your plan includes some of its best attractions: learn about winemaking at Bodega Garcia Hidalgo, take a stroll through Old City, see the sights as you ascend with a climbing tour, and get great views at Mirador puente nuevo de Ronda. To find more things to do, other places to visit, traveler tips, and other tourist information, read our Ronda tour site . Traveling by car from Seville to Ronda takes 2 hours. Alternatively, you can take a bus; or take a train. Expect a daytime high around 37°C in June, and nighttime lows around 19°C. Wrap up your sightseeing on the 19th (Wed) to allow time to travel back home.